Conjunctivitis, also known as pink eye, is a common eye problem that can afflict children and adults alike. It is highly contagious and spreads quickly in environments like classrooms or offices filled with multiple people in close proximity to one another. The good news is that conjunctivitis is easily treated and can be prevented. Conjunctivitis gets the nickname pink eye because it gives the affected eye a shade of pink. Symptoms of pink eye vary depending on which of three types of pink eye you have contracted. One or both eyes can be affected by these symptoms. Viral conjunctivitis produces watery and itchy eyes and causes sensitivity to light. It can be spread through coughing and sneezing. Bacterial conjunctivitis creates a yellow-green discharge in the corner of the eye. It can cause your eyelids to stick together while you are sleeping. This type of pink eye is spread through direct contact with infected hands or objects. Allergic conjunctivitis leads to watery, burning and itchy eyes. Other associated symptoms include a runny nose, stuffiness, and light sensitivity. Both eyes are affected by it, but this form of pink eye is not contagious. Causes behind a case of conjunctivitis vary based on which type you have contracted. Some types of conjunctivitis are more dangerous to the long-term health of your eyes than others. Viral conjunctivitis is caused by a virus. It is a contagious form of pink eye, but typically clears up on its own within a few days. 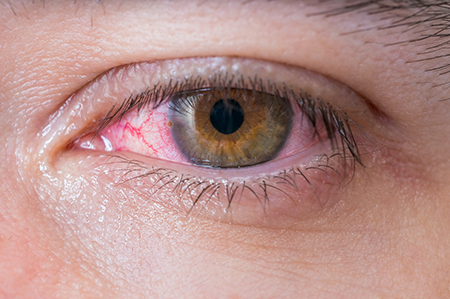 Allergic conjunctivitis is usually connected with allergies, so it typically flares up when exposed to seasonal irritants like pollen or everyday irritants like dust or pet dander. Bacterial conjunctivitis is the most dangerous type of pink eye. It results from a bacterial infection. If left untreated by an eye care professional, the bacteria can cause serious damage to the affected eye. Treatments for conjunctivitis vary based on the type afflicting your eyes. Viral conjunctivitis does not usually require medical treatment. A cold wet washcloth is often enough to relieve symptoms. Allergy medications can be effective in reducing or preventing bouts of allergic conjunctivitis. Bacterial conjunctivitis can only be treated through applying antibiotic eye drops or ointments prescribed by your eye care professional. If you wear contact lenses, switch to eyeglasses until your eye care provider has performed an eye exam to determine which type of conjunctivitis is affecting your eyes.